Want to learn more? Join the #StartingisBelieving Twitter Chat this Thursday, October 26th! More details below!! October 20, 2017 Terms and Conditions NO PURCHASE OR PAYMENT NECESSARY. A PURCHASE WILL NOT IMPROVE YOUR CHANCE OF WINNING. By RSVP’ing to this event and uti­liz­ing the #StartingIsBelieving hash­tag, the atten­dees acknowl­edge hav­ing read and agreed to these terms and conditions. Twit­ter Party Prize Give­away begins October 26th, 2017 at 9:00 pm ET and ends no later than October 26, 2017 at 10:30pm ET (the “Twit­ter Party Entry Period”). 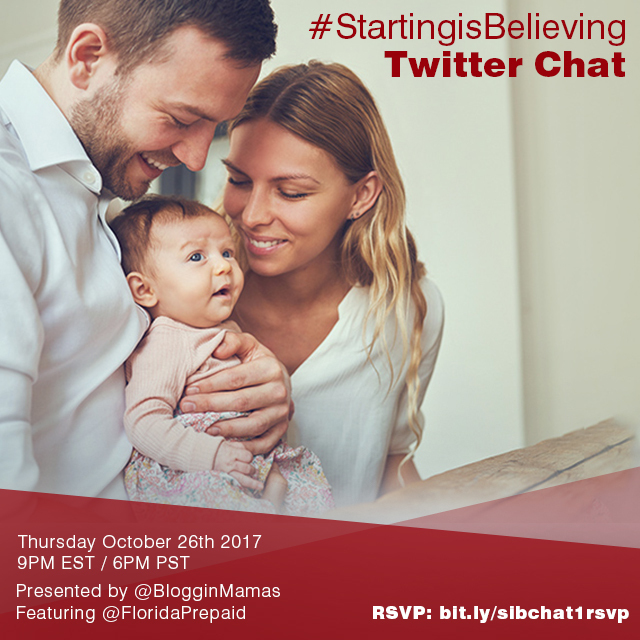 Entrants enter via fol­low­ing @FloridaPrepaid and @BlogginMamas, and post­ing a tweet with the #StartingIsBelieving hash­tag dur­ing the Twit­ter Party Entry Period. Five (5) Win­ners will be drawn ran­domly by random.org at approx­i­mately 12 minute inter­vals dur­ing the Twit­ter Party Entry Period. One (1) Win­ner will be drawn ran­domly via random.org from the event RSVP’s on the Mr. Linky widget. 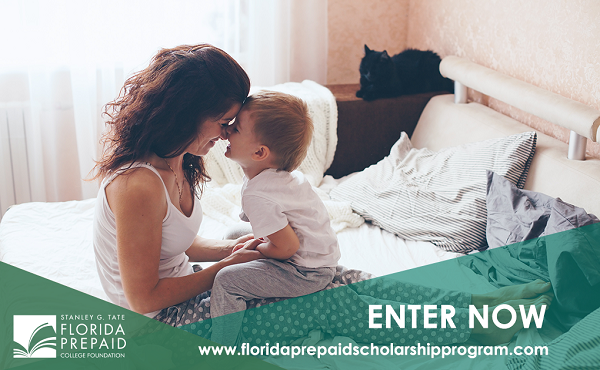 Prizes include: One (1) Florida Prepaid Prize Packs including items like a Slingpack or Backpack, water bottles, Frisbee, wristbands, and pencil pouches. ARV $150. Total approx­i­mate retail value (“ARV”) $150, for each of five (5) winners. One (1) Florida Prepaid Prize Packs including items like a Slingpack or Backpack, water bottles, Frisbee, wristbands, and pencil pouches. Total approx­i­mate retail value (“ARV”) $150, awarded to one (1) win­ner who RSVP’s via the Mr. Linky widget. Each win­ner receives one (1) prize pack. Entrants who fail to com­plete said actions will be dis­qual­i­fied and an alter­nate win­ner will be selected from all entrants who entered dur­ing the Twit­ter Party Entry Period. Win­ners will be noti­fied via DM (Direct Mes­sage) on Twit­ter with a request for an email address to send prize claim infor­ma­tion. Win­ners will have 48 hours to complete the prize claim form or an alter­nate win­ner will be selected from amongst all entries received dur­ing the Twit­ter Party Entry Period. All prizes will be awarded pro­vided they are validly claimed by October 30th, 2017 at 11:59AM EST. Entrants agree to release and hold harm­less the Blog­gin’ Mamas, Heather Lopez Enter­prises, LLC, Florida Prepaid, Moore Communications, Twit­ter, and any other orga­ni­za­tions respon­si­ble for spon­sor­ing, ful­fill­ing, admin­is­ter­ing, adver­tis­ing or pro­mot­ing this give­away, and their respec­tive par­ent, sub­sidiaries, and affil­i­ates and each of their respec­tive offi­cers, direc­tors, mem­bers, employ­ees, agents and sub­con­trac­tors (col­lec­tively the “Released Par­ties”) from and against any and all claims, expenses, and lia­bil­ity, includ­ing but not lim­ited to neg­li­gence and dam­ages of any kind to per­sons and prop­erty, includ­ing but not lim­ited to inva­sion of pri­vacy (under appro­pri­a­tion, intru­sion, pub­lic dis­clo­sure of pri­vate facts, false light in the pub­lic eye or other legal the­ory), defama­tion, slan­der, libel, vio­la­tion of right of pub­lic­ity, infringe­ment of trade­mark, copy­right or other intel­lec­tual prop­erty rights, prop­erty dam­age, or death or per­sonal injury aris­ing out of or relat­ing to a participant’s entry, cre­ation of an entry or sub­mis­sion of an entry, par­tic­i­pa­tion in this give­away, accep­tance or use or mis­use of prize. Entrant agrees to indem­nify, defend and hold harm­less the Released Par­ties from and against any and all claims, expenses, and lia­bil­i­ties (includ­ing rea­son­able attorney’s fees) aris­ing out of or relat­ing to an entrant’s par­tic­i­pa­tion in this give­away and/or entrant’s accep­tance, use or mis­use of prize, includ­ing, with­out lim­i­ta­tion, lia­bil­ity for per­sonal injury, dam­age, or loss. The Released Par­ties make no war­ranties, and hereby dis­claims any and all war­ranties, express or implied, con­cern­ing any prize fur­nished in con­nec­tion with the give­away. WITHOUT LIMITING THE GENERALITY OF THE FOREGOING, SUCH PRIZES ARE PROVIDED“AS IS” WITHOUT WARRANTY OF ANY KIND, EITHER EXPRESS OR IMPLIED, AND THE RELEASED PARTIES HEREBY DISCLAIM ALL SUCH WARRANTIES, INCLUDING BUT NOT LIMITED TO, THE IMPLIED WARRANTIES OF MERCHANT ABILITY, FITNESS FOR A PARTICULAR PURPOSE AND/OR NON-INFRINGEMENT. Dis­clo­sure: Blog­gin’ Mamas is being com­pen­sated for man­ag­ing this Twit­ter Party. Indi­vid­ual co-hosts are being com­pen­sated for their par­tic­i­pa­tion. All prize ful­fill­ment is the respon­si­bil­ity of the sponsor.